The political and social upheavals that have transformed the economies of Eastern Europe and the former Soviet Union during the past ten years have sparked considerable interest and speculation on the part of Western observers. 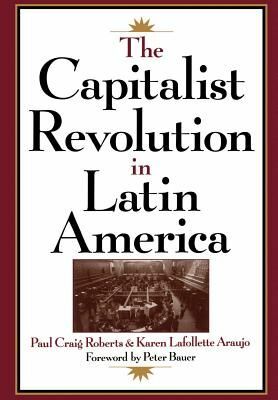 Less noted, though hardly less dramatic, has been the revolutionary spread of free market capitalism throughout much of Latin America during the same period. In a wide-ranging survey that illuminates both the history and present business climate of the region, Paul Roberts and Karen Araujo describe the economic transformation currently taking place in Latin America. And as they do so, they also reexamine many of the prevailing orthodoxies concerning international development and the regulation of markets, and point to the success of privatization and free enterprise in Mexico, Argentina, and Chile as harbingers of the economic future for both hemispheres. The potential strength of the economies of Central and South America has always been obvious, the authors point out. Abundant natural resources, combined with vast expanses of fertile land and a sophisticated and relatively cohesive social culture, are found throughout the region. But the authors show that the Latin American nations were slow to discard the economic and social climate that they had inherited from their Spanish colonial masters, who had ruled by selling government jobs--creating a network of privilege--and by suppressing through over-regulation the development of markets for goods, services, and capital. The prevalent cultural attitude in Latin America was hostile to commerce, trade, and work--indeed, it was more socially acceptable to court government privilege than to compete in markets. The authors further show that U.S. aid packages to the region actually reinforced this culture of privilege and further hampered the growth of a free economy. Not until the 1980s did the picture begin to change, largely in response to the economic crises brought on through catastrophic national debts and hyperinflation. The book describes the efforts of the Salinas, Pinochet, and Menem governments to combat the established interests of the local elites and the international development agencies, to privatized state industries, and to established independent markets. In this new climate, private capitalists and entrepreneurs are feted and celebrated, and productivity has risen to levels unimagined only a few years before. But this dramatic economic turnaround, the authors show, is a mixed blessing for the U.S. For if it provides us with a vast new market for our goods, it has also created a powerful new competitor for capital investment. To keep American and foreign capitalists investing in America, the government needs to make changes, which the authors outline in a provocative conclusion. Central and South America have a combined population of 460 million people, a potential market greater than the United States and Canada combined or the European Community. Thus the rise of free market capitalism in Latin America is of vital interest to the United States. The Capitalist Revolution in Latin America provides an insightful portrait of this dramatic economic turn-around, illuminating the economic consequences for our own society.